If you are fascinated by politics to the point of being obsessed, this page may interest you. Scroll away. If not, well, don’t say you weren’t warned…. Is strategic voting dead in Peterborough? Strategic voting is viewed with contempt and hope, often by the same people. We hate it and love it, all at once. As political debate in Canada becomes more polarized, and the prospect of more minority victories at all levels increases, the need for voters across the political spectrum to cooperate becomes ever more urgent. Right-of-centre voters unsuccessfully tried strategic voting in the ’90s, only to discover the necessity of merging under Stephen Harper and the Conservative Party in 2003. Left-wing voters voted strategically to defeat Harper and elected the Liberals in 2015. 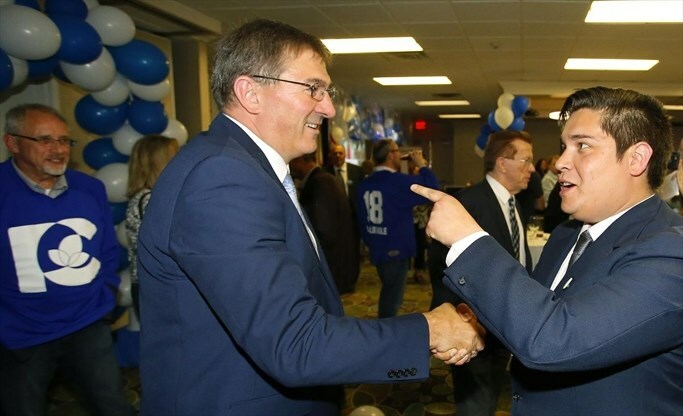 The Ontario Progressive Conservatives won this riding with 22,939 votes. The NDP came in a close second at 20,745 votes, only 2,194 votes behind, while the Liberals came in a distant third at 15,029 votes, almost 8,000 votes behind the Conservatives and 5,716 votes behind the NDP. The Greens came in fourth at 2,055. Eric Grenier’s Poll Tracker, the most reliable aggregation of polling data available (https://newsinteractives.cbc.ca/onvotes/poll-tracker/), showed the PCs and the NDP trading the lead from May 25 to Election Day. On June 6, Grenier’s projections stood at 38.7 per cent for the PCs, 35.5 per cent for the NDP and 19.6 per cent for the Liberals. Clearly the strategic vote in Ontario to stop Ford had to be NDP. Was this letter persuasive enough to convince 2,194 undecided voters to throw their support behind the Liberals? We’ll never know. With this letter, the Liberals claimed to have the one thing that undecided voters were searching for: Hard data on which to make their difficult strategic voting decisions. Which party had the best chance of stopping Dave Smith and his PCs? What methods were used to collect these “internal numbers?” How many people were polled? What did the local Liberal team know about the development of these “internal numbers?” None of these vital details were ever released. The local Liberal campaign team claimed that they had talked to 30,000 voters and knew their voting intentions. Their posts on social media are still there. What happened? There are only three explanations: (1) the polling firm — or campaign workers — who came up with these numbers were wildly incompetent, (2) many voters changed their minds in the polling booth and voted NDP anyway, or (3) these internal numbers were fabrications. Leal’s letter was enough to make NDP supporters who held their noses and voted Liberal federally in 2015 absolutely livid. But extreme partisanship can be a dangerous drug for anyone, regardless of party affiliation. Liberals felt just as angry, for different reasons: “We are the Natural Governing Party in Peterborough! How dare you NDP dimwits claim to be the only option? If you had voted strategically, Jeff Leal would still be our MPP and Ford would not be premier!” Their Twitter hashtag was #itsgottabejeff. It wasn’t Jeff. It was never going to be Jeff this time. Not by a long shot. To be fair, this is what all campaign teams must do. Every campaign team on earth needs to believe that they will win, especially when all the evidence shows that they are going to lose. It’s a tough game. Politics, next to hockey, is the closest thing we have to a blood sport in Canada. There is tripping, holding and fighting in hockey; there is deception, dishonesty and lying in politics. If you want to play either game, don’t say you weren’t warned. Local campaign teams must believe the directives that come from head office. Nonetheless, these tactics may have discouraged some undecided strategic voters from shifting their votes to the NDP. Where does all this leave us in Peterborough- Kawartha? Is strategic voting dead? Perhaps. Strategic voting in our riding usually means “vote Liberal.” On June 7, the shoe had to go on the other foot. Not enough Liberal and Green voters tried to put it on. When the call goes out from the Liberals in the fall of 2019 to rally around Monsef/Trudeau to defeat Skinner/Scheer, how many strategic voters will stand up to be counted? Or is this the wrong question? Is strategic voting not only a wrong game plan, but by placing our faith in elections, are we all playing the wrong game? Are the major issues our day — economic disparity, job losses due to technology, resource depletion, and climate change — really going to be resolved by governments, or are they going to resolved by self-organizing citizens from across the political spectrum who come together because they know their governments are incapable of making long-term changes that stretch far beyond the 4-year election cycle? In 50 years, when future historians sit down to explain the politics of the first two decades of this century, what will they make of the arcane election strategy we call “strategic voting?” A key to solving world problems or an outmoded reaction to a dysfunctional electoral system? The ability of voters to consume but not quite digest the daily bread of a modern political campaign is a particular by-product of our times. And it comes with lasting lessons about the future of how elections will be run – not to mention how our democracies will function. In our everyday lives as citizens, there are plentiful opportunities for effecting change, but few are more impactful than a local election. And on October 22, Peterborough will be heading to the polls, choosing a mayor, city councilors, and school board trustees who will guide this city for the next four years. Every election is important, but this local election feels particularly essential. Peterborough is transforming, with shrinking industry, increasing development and gentrification, rising housing prices, and Highway 407 looming, and along with it the possibility of Peterborough becoming just another bedroom community for Toronto workers. At the same time, we’re seeing growing divisions between the decisions made at City Hall and the will of many of the people. And this comes at a time of unprecedented social upheaval, environmental crisis, and technological change in the world. Creating the city we all want to see doesn’t mean fighting for or against any particular candidate, but rather trying to push all candidates (and all local media, and all Peterborians) to listen, to speak to the issues that matter to the citizens of Peterborough, and to collectively work to build the future that we all want to see. This is the work we want to undertake in our 2018 election coverage and engagement. Work starts this month, with two articles on the importance of citizen engagement in democracy: Electric City Magazine co-publisher Peter Pula writes about the work of Peterborough Dialogues in getting citizens involved in their city, and Elisha Rubacha of Nourish writes about their upcoming series of Democracy Talks. But we’re just getting started. On May 12, we’ll be hosting Peterborough’s first All Citizens Meeting (with more meetings planned in the fall). The idea is to give the citizens of Peterborough the chance to have their say about what issues are important to them this election, and to do it as early as possible in the election cycle. We want to help citizens lead the way in setting the agenda this election, instead of letting politicians and media do it for us. We will invite all the candidates out as well, and encourage them to listen and engage, but the conversation will be led by the people. And then, from June to November (the months leading up to the election, followed by a wrap-up), we’ll be dedicating a four-page pullout in each issue of Electric City Magazine to the election. Based on the All Citizens Meetings, we’ll use these pages to talk about the issues that matter to the people of Peterborough. We’ll also include primers on the frequently confusing processes of local politics, regular updates about election news, and profiles of candidates and wards. Our goal is to shift the conversation, and to give citizens the tools to make informed decisions this October. But at the centre of it is a belief that all of this needs to be citizen-led, and so we are encouraging everyone to get involved. Come out to the All Citizens Meeting (May 12, 12pm to 2:30pm at the Mount Community Centre) and tell us what issues you think deserve to be part of the conversation this election. Support our Deepening Democracy Patreon to help make this work financially viable. Read our articles and share them around. Ask questions of your local candidates, and push them to respond. Write letters to the editor. Post on social media. And keep the conversation going with your friends, families, and co-workers. We believe there are things in this city that need to change, and we’ve heard from you that you believe the same.